Virginia Gov. Terry McAuliffe gestures as he addresses a joint session of the the 2018 session in the House chambers at the Capitol in Richmond, Virginia, Jan. 10, 2018. Terry McAuliffe says he’s not ruling out a 2020 Democratic campaign for president as he campaigns in Iowa for candidates running in the November midterm elections. In an Associated Press interview Tuesday, McAuliffe says he’ll decide by late this year or early next year whether to seek the presidential nomination. Iowa’s precinct caucuses launch the presidential primary sequence. The Dow Jones industrial average dropped as much as 650 points, then recovered slightly, after Apple announced an earnings downgrade and laid some of the blame on President Donald Trump’s cockeyed economic policy. As to slower growth in China, Apple Chief Executive Tim Cook said, “We believe the economic environment in China has been further impacted by rising trade tensions with the United States. As the climate of mounting uncertainty weighed on financial markets, the effects appeared to reach consumers as well, with traffic to our retail stores and our channel partners in China declining as the quarter progressed.” That should worry both parties, but also inform Democratic primary voters as they look for someone to clean up the mess Trump will leave behind. On Wednesday, a successful West Coast governor who knows something about trade, Democrat Jay Inslee, suggested he would throw his hat into the ring for 2020. He is pitching himself as the guy to put climate change at the top of the nation’s priority list. “To govern is to choose,” Inslee told MSNBC’s Chris Hayes. He offered a list of his progressive successes — on voting rights, minimum wages, net neutrality, transportation, etc. — and made the case that green technology makes climate change a “jobs message” as well. He might consider stressing his entire record as evidence of his ability to successfully govern, which includes climate change policies, and his role in challenging Trump’s vile immigration policies. Almost as an afterthought, he notes that renewable-energy legislation helped launched a multibillion-dollar wind industry and helped his state lead in GDP growth and wages. That seems to be his greatest selling point – creating a progressive haven while growing the economy, raising wages and saving the planet. If Inslee can articulate a vision entirely at odds with Trump’s and evidenced by his successful stewardship, he could be onto something. 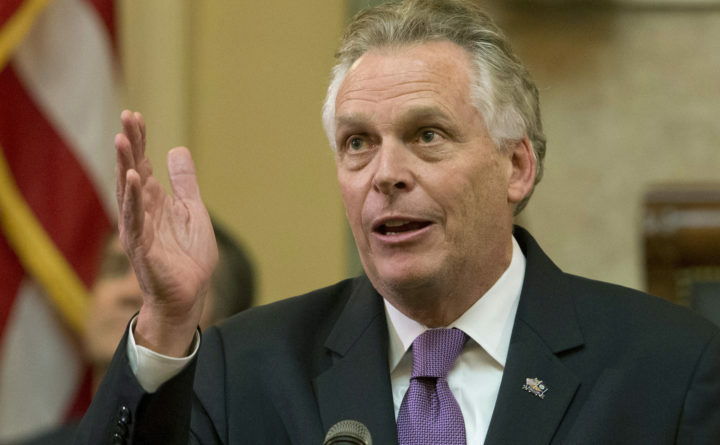 McAuliffe will have to overcome his association with the Clintons and big-money politics. He’ll need to avoid sounding like Debbie Downer raining on the progressives’ dreams. However, his effort to tie his own candidacy, should he decide to win, with the party’s successes running moderate candidates holds promise. (“As we approach 2020,” he writes, “we should look at the candidates who won in swing districts in 2018. They are an energetic, diverse group who ran on realistic goals of lowering the cost of health care, improving education and raising wages.”) He could make his message a unifying one as a candidate for all Americans (urban poor, suburban middle class, college and non-college-educated): Trump is hyper-divisive and a failure at governance; McAuliffe is the uniter who knows how to govern. Whether either or both of these governors can mount a viable campaign remains to be seen, but their presence in the race would provide a much-needed emphasis on practicality and competence. Trump, who cannot keep the government open with Republican majorities in both houses, could enter 2020 with a faltering economy, a massive debt, a health-care system hobbled by his own machinations and a ridiculous energy policy based on fantasies like “clean” coal. A competent governor from the center-left might be a welcome alternative to President Chaos.